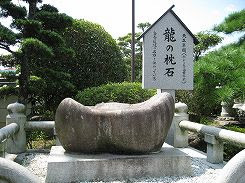 Ryuudooji 龍洞寺 Ryudo-Ji "Dragon Cave Temple"
There are various temples with the name Ryudo-Ji in Japan. near shrine Kasuga jinja in Kakuda town. Once upon a time, a dragon who lived there used it as its pillow. The trees around this huge boulder are strangely twisted. 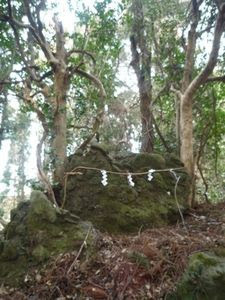 It became a natural treasure in Heisei 23 and is painted on a votive tablet of nearby temple Fukuooji 福應寺絵馬 Fukuo-ji. This temple has a famous hall for ema. There are other temples named Fukuo-ji in Japan.